Once sacred, The Oracle at Delphi Was Lost For a Millennium. See How it Was Found. Relying on clues from the past, a team of 19th-century archaeologists uncovered Delphi, the site where ancient Greeks asked questions, and Apollo answered them. Excavated between 1895 and 1897, the amphitheater of Delphi sits up the hill from the Temple of Apollo. A massive space, it was able to seat an audience of up to 5,000 people. Musical, poetic, and dramatic performances were staged here. Greek myth holds that the thunder god Zeus once dispatched two eagles flying in opposite directions across the sky. Where their paths crossed would be the center of the world. Legend says that the birds met over Delphi, seated on the slopes of Parnassós. Zeus marked the spot with a stone called the omphalos (navel), to signify the location’s centrality. According to another myth, this impressive spot in central Greece (about 100 miles northwest of Athens) was originally sacred to Gaea, mother goddess of the earth, who placed her son Python, a serpent, as a guard for Delphi and its oracle. Apollo, god of light and music, slew the serpent and took over the site for himself. Priestesses who served Apollo there were called the “Pythia,” named in honor of Gaea’s vanquished son. Throughout the classical world spread the belief that these priestesses channeled prophecies from Apollo himself. The cult of Apollo seems to have been functioning in Delphi as early as the eighth century B.C. About two centuries later, leaders from all over Greece were consulting the oracle on major issues of the day: waging war, founding colonies, and religious rituals. Since it was a place used by different—and often rival—Greek states, Delphi soon became not only a sacred space but also a place where a city-state could exhibit its status to the wider Greek world. If a particular city wanted to flaunt its success in war or trade, it could build a commemorative monument at Delphi. This practice led to an astonishing accumulation of monuments and sculptures at Delphi. Each piece serves as a visual guide to the power shifts in the region. Athenians, Spartans, Macedonians, and Romans all poured their wealth into making the “center of the world” reflect their glory. Delphi also hosted athletic, poetry, and music competitions. It was the venue for the Pythian Games, held every four years, second only to the ones held in Olympia. All that remains of the Temple of Apollo, situated on the third terrace, are six broken Doric columns. Here the Pythia would deliver prophecies to those who came to consult the god. Despite its status as a sacred site, Delphi was an attractive target for pillaging. An attack by the Persians came in 480 B.C., and one by the Gauls followed in 279 B.C. Rome took over Delphi in 191 B.C., but allowed the religious rituals and athletic competitions to continue. Things changed when Christianity became the official religion of the Roman Empire in A.D. 380. Between 391 and 392 Emperor Theodosius I banned pagan practices and closed Greek temples, including those at Delphi. With its religious function stripped away, the site fell into decay. A small settlement took root at the site and grew into the village of Kastri. Visitors were very rare in the centuries that followed. In 1436 an Italian merchant, Cyriacus of Ancona, made the arduous journey to Delphi, with his notes revealing what was left of the stadium and the theater, a round building he mistook for the Temple of Apollo, with some of its statues still standing. Greece became a part of the Ottoman Empire in 1453, which postponed Cyriacus’s idea to “restore antiquity, or redeem it from extinction.” The former center of the world would remain in obscurity for roughly 400 years. It waited, in fact, until Greece became independent from the Ottomans in 1832. Greece felt a new need to encourage an appreciation of its glorious past and protection of its rich culture. It enacted laws against the sale of antiquities, created the Greek Archaeological Society, and encouraged archaeological endeavors from interested European countries. The excavation of Delphi would prove a gargantuan task. The homes in Kastri would need to be forcibly purchased, the residents compensated, and then relocated. Greece could not afford such a major expenditure, so it had to rely on foreign capital. In 1840 and again in 1860 archaeologists conducted preliminary studies in open areas of ground. They unearthed part of the temple substructure and a section of its supporting wall, covered with inscriptions. Despite the Greek Archaeological Society’s efforts to convince the inhabitants of Kastri to move, the homeowners soon figured out that their lands were valuable and demanded more money. Circumstances changed when a powerful earthquake brought down large rocks from the mountain, destroying the village and killing 30 people. 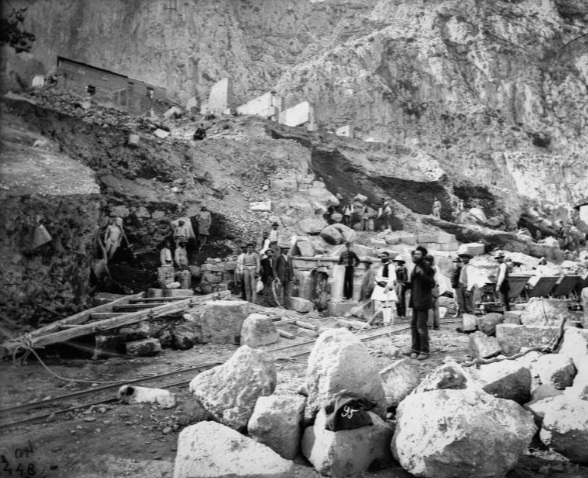 Left: Excavation status at Delphi in November 1893. Right: In 1894, Albert Tournaire painted how he imagined the Santuary of Apollo appeared in Ancient Greece. Following the disaster, a commission set about searching for a new site to replace the thousand village plots and to negotiate with the residents. Seeing that the funds available were no match for the stubbornness of the villagers, the Greek Archaeological Society ceded the land to the French so that they could carry out a small excavation in 1880. Bertrand Haussoullier, director of the French excavations in Delphi at this time, concentrated on the immediate area between the sectors excavated earlier. Haussoullier was convinced that he was looking at the temple terrace, but he was confused by the walls in front of him. The excavations revealed that it was the esplanade next to the terrace, where commemorative monuments had been erected by the different city-states and regional powers throughout the sanctuary’s history. The walls belonged to one of these monuments, the Stoa of the Athenians, built in the early fifth century B.C. to house trophies won in naval battles. Alongside appeared the collapsed column of the Sphinx, an offering from the island of Naxos. This tholos, or circular temple, is located on the Marmaria terrace in Delphi, nearly half a mile from the sanctuary of Apollo. Part of a temple dedicated to Athena, goddess of wisdom, the columns standing today were reconstructed in 1938. Founded in 1846, the French School at Athens was in close competition with its German counterpart, the German Archaeological Institute, for access to sites in Greece. When the Germans were granted exclusive rights to excavate Olympia in 1874, the French lobbied hard for exclusive access to other classical sites. Homolle’s team took this photograph on May 30, 1893, when the statue of Kleobis first emerged, largely intact, from the ground. In 1881 Greek prime minister Aléxandros Koumoundhoúros put exclusive access to Delphi on the table. He offered Delphi to France in exchange for its support in Greek territorial claims. The French were hesitant, and so began a 10-year period of negotiations, which the French called the “Trojan War.” Delphi became a bargaining chip. In the end, King George I of Greece signed an agreement on April 13, 1891, allowing the French to work exclusively at the site. The Grande Fouille (Big Dig) was due to begin in September 1892, but the villagers, concerned because they had not yet been paid for their lands, turned up at the entrance and refused to allow anyone in. The police were called to protect the archaeologists until the villagers were paid. Work continued from 1892 to 1901 and was overseen by Théophile Homolle, future director of the Louvre Museum. It was a complex project: The site measured more than 200,000 square feet; there were 200 laborers working for 10 hours a day; and nearly two and a half miles of train track had to be laid to support the 75 cars necessary to haul away over one million cubic feet of excavated earth. Despite the difficulties of the location—wind, rain, and rockfalls—the French efforts soon yielded wonderful results. In 1893 they uncovered the main altar of Apollo’s temple, the Altar of the Chians, as well as the Sybil rock where the Pythia made her prophecies. The Athenian Treasury, also discovered in 1893, featured a truly noteworthy find: stone blocks inscribed with the words and notated music of the Hymn to Apollo. (Interested in more sites from Greek mythology? Dating to different eras of occupations of the site, statues of athletes were common among the artifacts at Delphi. Discovered a year apart from each other, the twin statues of Kleobis and Biton date to about 580 B.C. These two massive freestanding figures stand more than eight feet tall and represent two mythological brothers famous for their strength. In 1896 the most famous athletic statue was unearthed: the impressive bronze figure of the Charioteer. Standing about six feet tall, the freestanding statue is believed to be part of a much larger group of sculptures, now lost. It was recovered from the Temple of Apollo, where it had been buried by a rockslide in the fourth century B.C. Inscriptions near the base indicate that it was erected in the 470s B.C. to commemorate a racing victory in the Pythian Games. The archaeologists worked hard to uncover different structures at the site. Between 1896 and 1897 the theater and stadium that held the Pythian Games were excavated, followed by the gymnasium and the Castalian Spring, and, beginning in 1898, the lower terrace or Marmaria where the Temple of Athena Pronaia stood. A rear view of the reconstructed Athenian Treasury. Its Siphnian counterpart stood nearby, to its left, a bit farther down the Delphinian Plateau. The French kept scrupulous journals of the excavation, made use of photography to document their finds, and published annual reports that documented their progress. These innovative practices soon became standard for archaeology. When the dig came to an end, Homolle was unimpressed by all the dig’s successes. He declared he was disappointed “not to have found a metope or a piece of frieze, nor even the finger of a figure on the pediment of the temple,” nor the chasm mentioned in ancient texts. The Big Dig was the start of a long journey that continues to this day to uncover the secrets of Delphi. Restoring this iconic place of the ancient world has revealed the complexity of religion, wealth, and power in the world of the ancient Greeks.